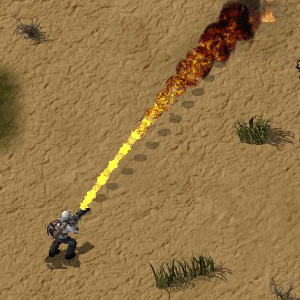 The flamethrower is an advanced weapon best used against hordes of enemies or trees. It deals initial splash damage in a large area and damage over time until the fire goes out. The damage is usually enough to destroy a biter nest with just one attack. It requires flamethrower ammo to function. Spraying fire in one spot long enough will increase the burning time of that spot, as well as create a gradually growing area of flames, depending on how long the fire was sprayed there. Destroy 10k trees with fire. Added fire. Fire will spread between trees and cause forest fires, causing a large amount of pollution to be released. Added flamethrower and flamethrower turret damage upgrades. Now deals significantly more damage. This page was last edited on 9 April 2019, at 04:12.